Cut the potatoes into wedges, then boil for 15-20 minutes, until fork tender. Drain and put potatoes in a mixing bowl. Make the vinaigrette by whisking together Marukan Organic Rice Vinegar, olive oil and stone ground mustard. Season with salt and pepper. Set aside. In a skillet over medium heat, add the bacon, diced onion and minced garlic and sauté for 6-8 minutes or until bacon is crisp. Remove from skillet and add to the potatoes. 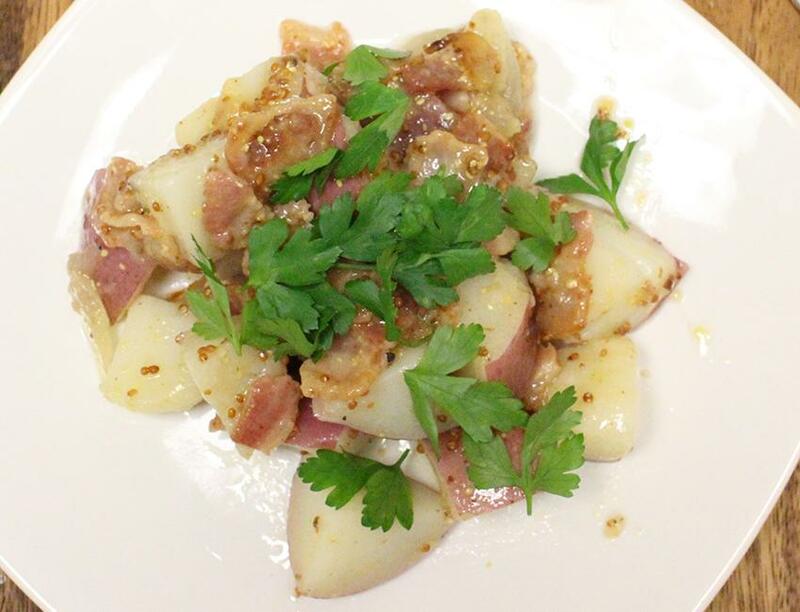 Pour the vinaigrette over the potatoes and the bacon and toss gently until all the ingredients are well-coated. Serve warm or cold and garnish with parsley.